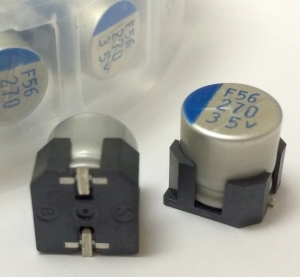 NIC Components is pleased to announce the addition of NSPE-TF series, of surface mount aluminum electrolytic capacitors, to its growing family of hybrid construction capacitors. Hybrid capacitors incorporate the best elements of both solid polymer and liquid electrolyte construction to provide ultra-low ESR, high ripple current ratings, with low leakage current and superior stability over voltage and temperature. NSPE-TF series is AEC-Q200 qualified, for use in automotive applications, and is ideal for higher temperature harsh operating environments, where high voltage and stability are required. NSPE-TF series utilizes improved aluminum foil technology, resulting in higher capacitance values, and reduced case sizes, with long lifetime rating of 4,000 hours at +125degC. The NSPE-TF series is rated for use over -55degC to +125degC, in capacitance values from 10uF to 470uF with ±20% (M) tolerance, and voltage ratings from 25VDC to 80VDC. The liquid electrolyte, used within NSPE-TF series, has the advantages of high surge voltage resistance, self-healing and open mode wear-out, as compared to solid construction tantalum and solid polymer type aluminum electrolytic capacitors. Supplied in 6.3mm x 6.1mm to 10mm x 12.5mm case sizes (DØ x H), NSPE-TF series is compatible with Pb-free reflow soldering up to +260degC. Both RoHS and REACH compliant, NSPE-TF has unit pricing from $0.32 to $0.65, with lead times from 8 to 10 weeks. Please contact NIC today, for free evaluation samples and to review your application requirements.